A food supplement with 5 microbiotic strains in the dose of 4 billion bacteria and vitamin D.
Lactibiane Enfant consists of 5 specific strains in the dose of 4 billion bacteria per sachet: Bifidobacterium longum LA 101, Lactobacillus helveticus LA 102, Lactococcus lactis LA 103, Streptococcus thermophilus LA 104, Lactobacillus rhamnosus LA 801. 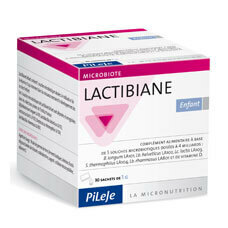 Lactibiane also contains vitamin D3, which contributes to normal growth and bone development in children. Microbiotic strains in Lactibiane Enfant selectively bred by PiLeJe are registered in the National Collection of Microorganism Cultures (CNCM). Bulking agent: potato starch, lactic ferments, dextrose, chicory root fructooligosaccharides, maltodextrin, carrier: cellulose, vitamin D.